Privately set within a large corner plot in an affluent area of Peyia, this impressive 4 bedroom detached Cyprus Holiday Villa has been designed, furnished and landscaped to the highest standards and offers a real taste of traditional Cypriot village life. The villa is located in an elevated position within a district of vineyards and moorlands with both Coral Bay and Peyia village centre just a stones throw away. The villa enjoys all modern comforts as well as beneficial extras such as 10m x 5m Private swimming pool, Gazebo with large dining table (to seat 8) and stone built BBQ, large leather sofas, Satellite TV, Ipod Docking station with speakers, Wi-Fi, 4 double sized bedrooms, 2 en-suites, a family shower room and cloakroom, dishwasher and much more. All this added to the Cyprus sunshine, the views across the vines to the Med and the outdoor seating/lounging areas and you are in for a great holiday at Villa Foster. On entering the villa itself, you immediately sense the modern clean lines and smart design features. The lounge has an LCD TV with Satellite and DVD, and is accompanied by 3 large chocolate leather sofas to comfortably seat 8 people. The dining table has high backed leather cushioned chairs with large wooden table again seating 8 comfortably. The kitchen is well equipped with fitted units in beach, black granite work surfaces and mosaic tiled splashbacks. Major appliances (in stainless steel colour) include tall fridge/freezer, dishwasher, washing machine, oven hob and hood and microwave. Access from the lounge can be gained to the outside areas of the villa as well as a useful downstairs double bedroom with its own En-Suite shower room. (This bedroom could be very useful for the elderly or infirm with access to the garden and pool directly from same). A fully tiled cloakroom completes the internal areas of the ground floor. Access to the upstairs accommodation is gained by a wide and open turreted staircase and landing. The master bedroom features a double-sized bed, fitted wardrobes, and an en-suite shower room which has a large double cubicle. The second and third bedrooms are twin rooms with fitted wardrobes, and share a sizeable shower room with double-sized cubicle, wc and wash hand basin. Sea views can be enjoyed from most windows in the upstairs and access can be gained to the upstairs balcony which in itself is a prime area of the house. Comfortable outdoor sofas allow relaxation and enjoyment of a refreshment and the stunning views to both the Mediterranean Sea and surrounding mountains. Outside, the villa has an extremely generous landscaped garden featuring a 10m x 5m private pool with ample room for sunloungers (8 supplied). A gazebo with adjacent stone built BBQ (there is also a Gas BBQ) and large table and chairs provides the ideal place for relaxing in the shade, taking in the views, alfresco dining and socialising with your party. ''Amazing, the outside space was perfect and the pool size was brilliant. Inside was spacious and comfortable and had all the amenities we needed. It was an ideal location for us, a few minutes drive to shops, restaurants and bars, but we set far enough away from the hustle and bustle of the town to feel very relaxed and where we were was lovely and peaceful. We preferred Corallia beach to Coral beach, it was lovely for the children and you can still do water sports from there. We really enjoyed Samisen and Andrea in Coral Bay for food, Samisen was great fun and the food at both is very good. Latchi Water sports was great, we hired a boat twice from the, they are a very professional company and we got our 15% discount so thank you. We also used Cyprus Mini Cruises to visit the blue lagoon, which was also a lovely day out, but the private boat hire was obviously much better, the kids loved the rubber ring at the back of the boat! ''The villa itself was great, it was better than we expected, very clean and extremely well equipped, the pool was fantastic so much so that we struggled to ever actually leave! The welcome pack was really great as we didn't arrive till very late due to a delayed flight. 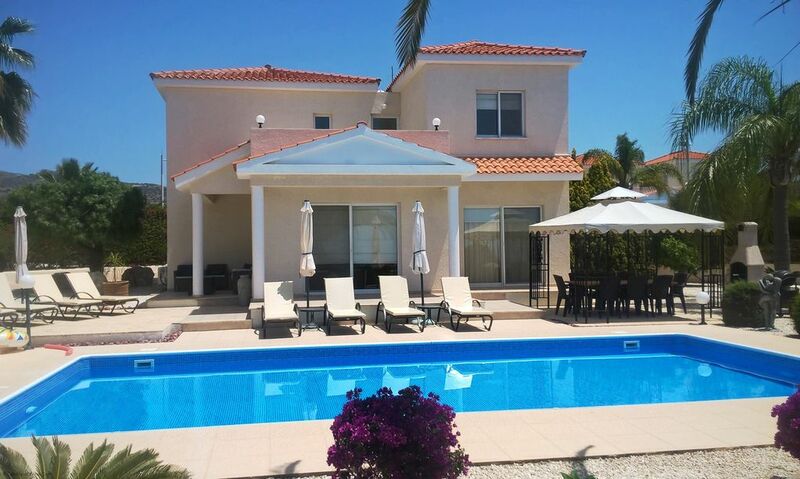 Location was great, we had a car and found it really convenient for shops and restaurants, coral bay, paphos and we also drove to Latchi a couple of times which was very easy. So that was good while still being a distance from the noise and busyness of the main tourist areas. We loved Jayanta Restaurant in Paphos, we went twice, we also did a boat trip to the blue lagoon from Latchi which was enjoyable. Pafos Zoo was quite enjoyable as well. ''The villa was perfect, could not fault in anyway. Very modern but homely at same time. The location was perfect for us, in a very quiet area with lovely views, although not to far from shops restuarants as we liked to walk down early evenings to the bay area. We recommend Ocean basket, Samisen, peyia tavern. My family and I had the most amazing time staying at Villa Foster (2 adults, an 18 year old, 9 year old and 6 year old), the villa is immaculate with everything you could possibly need for a home from home holiday. The outside space is fabulous, we all had great fun in the pool (which is a great size) and we enjoyed several bbq’s of an evening. The property managers were really helpful too, I had a couple of queries during our stay and Louise was great. Air con made it very comfortable indoors and the kids had a wide range of English channels to choose from when they wanted to escape the sun. The recommendations in the villa information book are definitely worth bearing in mind too, we dined at several of the places mentioned in it, Samisen in coral bay was a very entertaining evening! We loved Corallia beach, it’s great for the kids and is a bit nicer I think than coral bay. We hired a boat from Latchi Watersports on 2 occasions and would definitely say give this a try, we had a rubber ring on the back of the boat, which the kids loved! It’s also a great way to visit the blue lagoon and other bays in the area. We would love to visit Villa Foster again, I think this is the best villa holiday we’ve had so far. Thank you to Steven at Lets Rent Online for all of his help too. Villa Foster is a beautiful villa, in a secluded spot. The outdoor facilities are fabulous, with lovely pool with total seclusion, bbq, covered area to eat, adequate seating/lounging and really pleasant garden. The villa is very well maintained- air conditioning and ceiling fans in the bedrooms, every room very comfortable and pleasant double (no duff tiny bedroom) and kitchen well stocked with utensils etc. WiFi only worked downstairs but this was not a problem. Bear in mind you really need a car - restaurants and shops are realistically bit of a stretch to walk to. Loads of choice of eating places and shops 15 mins drive. We will definitely be back! I can not recommend this villa and the people managing the accommodation highly enough. From start to finish the service received has been superb. We are seasoned travellers and I can honestly say this has been one of our favourite holidays. The villa is totally spotless with a gorgeous pool, gardens and outlook to the sea in the distance. The amenities inside and outside the villa are gorgeous and we enjoyed many an evening sat out with a bbq going and a glass of wine. The kids loved the pool!!! And what a fair size it is! We didn’t hire a car and found Andy’s Taxis very helpful shuttling us to the local town of Coral Bay, the supermarket, a family wedding in Paphos and the waterpark. Again, highly recommended. There’s a large supermarket approx a mile away (Phillipos) which offers a wide range of self catering supplies including a wonderful fish and meat counter and a fresh bakery. You will find all you need here and they also deliver! If you venture into Coral Bay for food check out the Japanese Teppanyaki restaurant. Can’t remember the name off hand but a quick google search will assist you. Fab fun for an evening out. Also Chalkies bar was fabulous for cocktails and entertainment. We have thoroughly enjoyed our stay here in Cyprus and can not wait to come back to Villa Foster. I am already planning out next trip. Villa Foster is a beautiful villa. Fully equipped with everything required, very clean and tidy. The pool area has lots of room for relaxing in the sunshine all day and the pool is fantastic. As we had stayed at this villa before, we knew exactly where it was. A few minutes drive from Peyia Village and Coral Bay. We ate out every night! Our favourite restaurants are Trattoria La Vigna, Andria, Seriani and Ocean Basket. We have booked through LetsRentOnline.Com 4 times. They offer a very professional service, always reply promptly to any queries/concerns and return the security deposit within a few days. Communication and service received from local managers was good. Pool cleaned regularly and villa thoroughly cleaned mid stay, Everything is always wonderful. We stayed in Villa Foster for 11 nights and loved every minute of our stay. The villa is immaculate and has everything you would want from a home from home place in the sun. It is in the lower area of Peyia and has amazing sea views, it is also within easy driving distance of Peyia village and Coral Bay. The villa itself has U.K. TV channels and Wifi, and the swimming pool and gardens were lovely. I wouldn't hesitate to recommend this villa to anyone thinking of staying in this part of beautiful Cyprus. 5 of us stayed at villa foster aged between 25-55, we had such a fantastic holiday. The villa itself its great, good sized rooms, clean, amazing pool area with a nice outside table next to the bbq. The villa can fit a lot more people, we didn't use one of the rooms. We hired a car and did daily runs back and forth to the supermarket, its a very short drive to the supermarket and to all the bars and restaurants of Coral Bay. We are returning to the villa in 5 weeks time and we are all very much looking forward it. I actually got engaged in the villa when i was there last year so it will now always be a special place. Winding up through the banana plantations after a short drive along the coast road from Paphos brings you to Peyia where the Villa Foster is located on the hillside overlooking Coral Bay. Peyia is a very typical Cypriot village. A beautiful ancient church forms the heart of the village while the narrow streets and alleyways are full of old and interesting houses adorned with colourful flowers and citrus trees. The village is still largely unspoilt with lively tavernas and friendly locals combined with an ever improvong and growing list of quality amenities. You can also buy all your provisions including fresh meat and bread in the village stores; the early morning aroma of freshly baked bread, sweet and savoury local pastries and cakes coming from the Peyia bakery is almost too much to resist! For the more energetic types there is the local Tower Fitness Centre’. Golf: 4 Golf courses are within half an hours drive. Please ask for further details.